Steven (Chicagoland, United States) on 9 January 2018 in Landscape & Rural and Portfolio. Standing below Horseshoe Falls as its rushing water silences everyone's conversations. Thankfully the wind was blowing the mist out toward the Falls and away from the camera. Click HERE to view my video on YouTube. Wow - we can sense the power in the torrent of water and excellent capture with the colorful figures in the foreground. Oupsss ..il vaut mieux être protégé ..
A lovely image. I have done this myself and it is great fun. They should consider to install some giant fans there to blow the water out, so tourists can stay dry and reduce the use of so many rain ponchos. WHy not build a roof over the platform where they stand? Great capture, I can feel some drops here. @Blikvanger: Before coming to this point, you have to walk behind the Falls, where you can get wet. After watching your video, this really comes to life! In this case you were lucky, if the wind had gone the other way, ... no picture ! I've watched the video. The noise is impressive. A fine picture of this group which appears ready for the mist. For the cameras, it would be thankful the mist is blowing away. There are always those who are more adventurous and do the visit without protective covers. The sense of hearing and feeling the water to fall just off of us should be imposing. A super image of the tremendous flow of water. A neat video of the power of the falls, too. 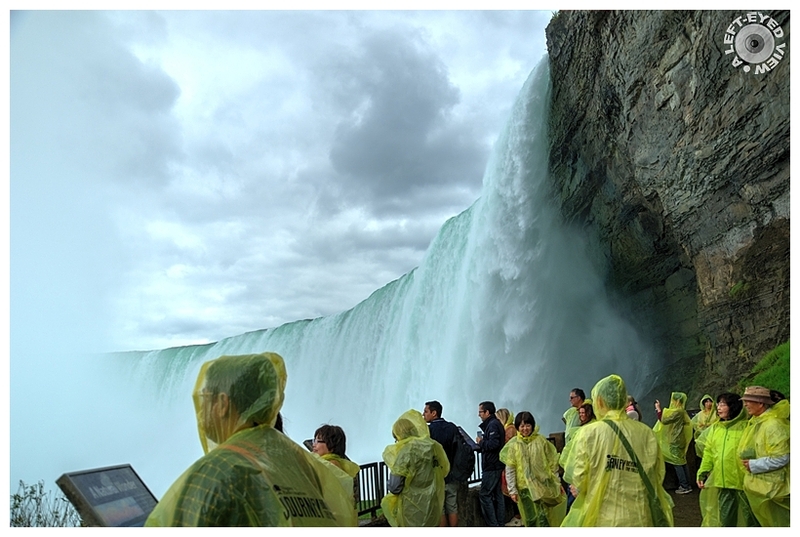 Another clever capture that shows the incredible power of the falls ... and how wet you can get exploring them! Very nice. I checked out the video. Such power in that water. A gorgeous image. Such an interesting view seeing the water coming down right in front of you. The video is fabulous! You really get a feel for the power with water rushing down and hearing how loud it is. Just fantastic - amazing sense of scale. I love this image - and your video really gives a "voice" to the power of the falls!